In each pack of Deesse's for natural colour design treatment , there are 4 tube's of hair treatment for you to use every 7 day (which would last you roughly a month). And i absolutely love that it comes in convenient mini packs to make sure you use the right amount to be applied to your hair when you shower. First, you might need to wash your hair and use your usual shampoo to make sure that you hair is all clean from dirt. Followed by applying the Deesse's for natural colour design treatment ( as a replacement to your usual conditioner). How the tube of conditioners works. So after applying the Deesse's for natural colour design treatment, the texture isn't that much different to any other conditioner. But it felt pretty moisturising once i applied it on my hair. After washing it off, you can see the difference of before and after applying Deesse's for natural colour design treatment. It definitely felt smoother, and it does moisturises the texture of my hair after colouring it (since after colouring your hair, it would usually get your hair to be slightly dryer if your hair isn't healthy enough). So yeah, basically Deesse's for natural colour design treatment provides the nutrients that your hair needs. After 3 weeks // total of 3 times of using the treatment. And yes, after 3 weeks of using Deesse's for natural colour design treatment, my hair colour is still there! And i guess, you can tell that it looks healthy too! (Im happy!) Haha. 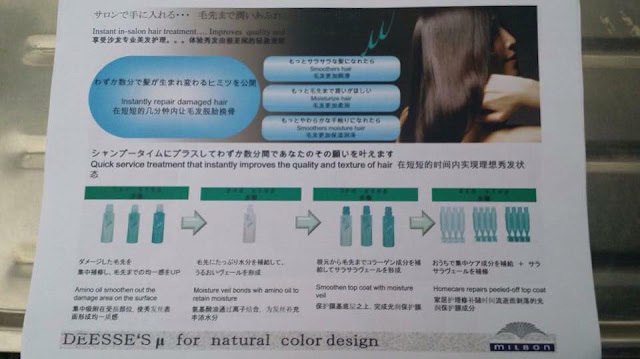 If you're tempted to get your hands on Deesse's for natural colour design treatment, i think you can give Daisuke Salon De Coiffure a call, or a visit to enquire on how you can get hold on the product. Some other information, given by Ai. 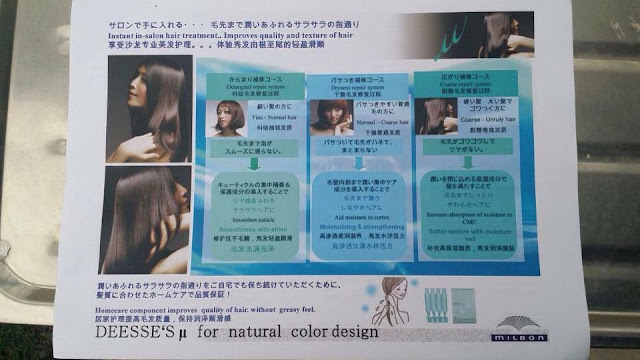 More on Deesse's for natural colour design treatment. For more information on Daisuke Salon De Coiffure, do head on over to their Official Facebook Page at https://www.facebook.com/DaisukeSalon?fref=ts.